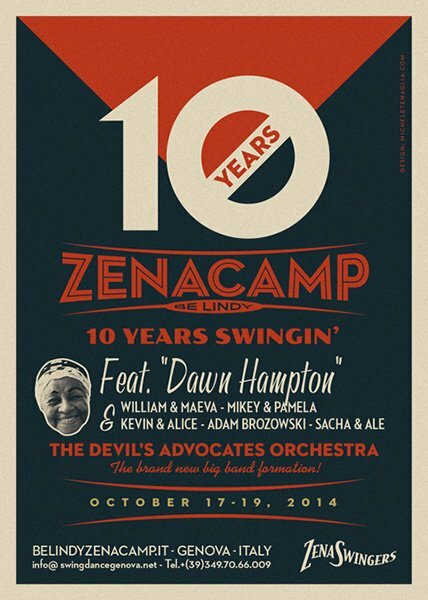 Zenacamp is a festival dedicated to swing music and dance held in Genova since 2005. Along the years the best musicians and dancers of the genre have been there. 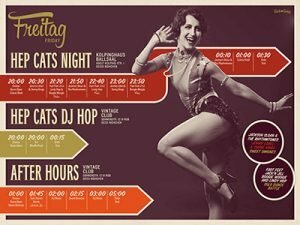 Dancers from everywhere join the event to attend workshops and to dance to great live music in a typical atmosphere of the past century. A new logo, a campaign and a new website were realized to celebrate the tenth anniversary. 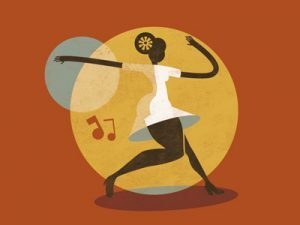 The Festival is organized by Zenaswingers, a group from Genova engaged in the preservation and popularization of the swing traditions in all over Italy. I have realized many works for them, always trying to mark every event with its own peculiar identity. Behind every project, as this one, there is a long and steady stylistic and iconographic research, made on books, on the web, and by keeping my eyes open when I walk on the street. An old sign, a candy box, a pack of cigarettes, there are so many cues the past has left around us. 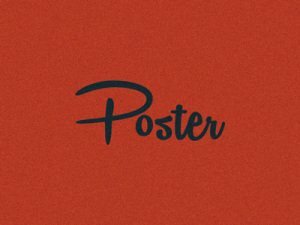 Communication as it was once, at the time of the poster designers and affiches. 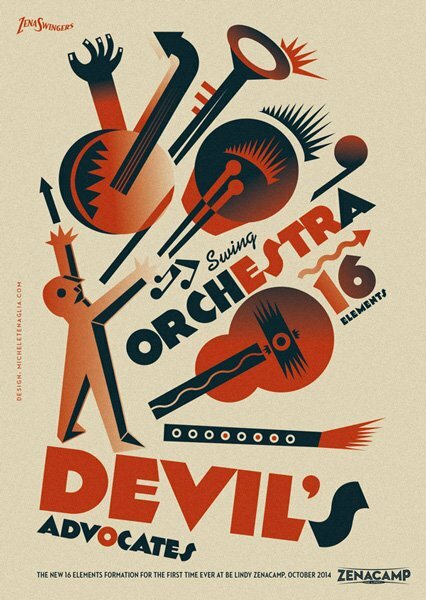 For the poster of the gig I used as reference Fortunato Depero, an Italian artist whose work I admire. Based on the poster and the Futurism style, I created a dynamic illustration where the conductor (in this case you would say band leader) with a gesture makes all the instruments of the big band move and play. All the contents fit in one page with a a fixed navigation bar. This solution is very comfortable for users, allowing them to find easily any information about the swing festival. The simple navigation, the engaging contents, the vintage design and the fast loading time give a good experience to the users. 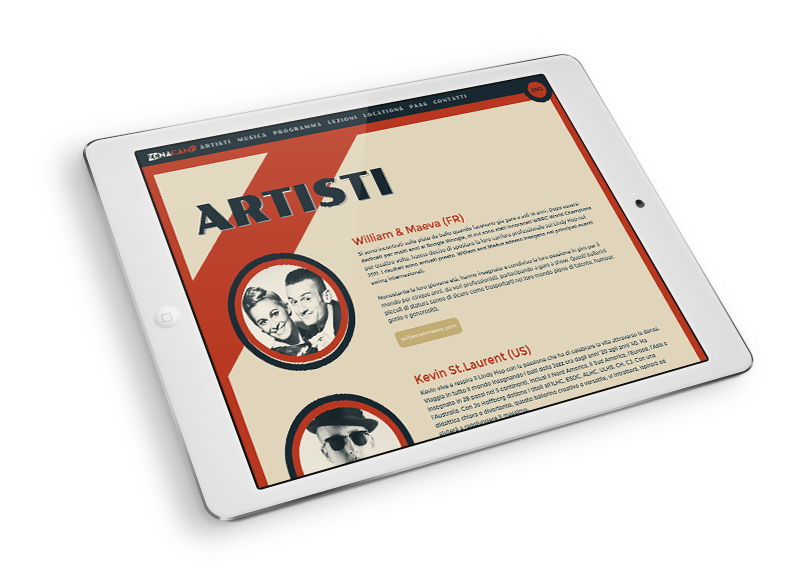 The website of course is responsive, allowing an optimized visualization on every device. Vai al sito.